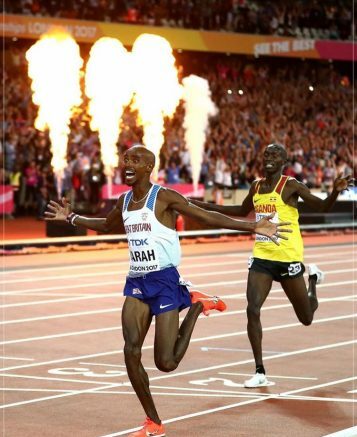 4th August 2017 – On the opening night of the 2017 IAAF World Athletics Championships, Sir Mo Farah (GBR) won his third straight World 10,000m title, and his 10th straight global distance final. In the same stadium that saw him win double gold at the 2012 London Olympics, the partisan home crowd roared him on for 25 gruelling laps as the pretenders to his throne threw down challenge after challenge. In what has now become a familiar story but one that should never be taken for granted, over the final 100m Mo finally moved clear and set the fireworks into the night sky as he crossed the line in a fast 26:49.51. The challenge of completing a fifth straight distance double will begin on Wednesday as Mo competes in the 5000m heats. Ugandan Timothy Toroitich (UGA) ran a personal best of 27:21.09 to place fourteenth. Earlier in the night there was smooth progress into the semi-finals of the women’s 1500m for Winny Chebet (KEN) as she took an automatic third qualification spot in her heat, and Usain Bolt (JAM) began his final individual pursuit for World gold winning his heat of the men’s 100m.